Selecting a suitable venue for your wedding can make the difference between a good day and a fantastic day. If you are on the search for a classic and historic building in Melbourne where you can hold your wedding ceremony and reception, Quat Quatta is one of the few names that will constantly be suggested; and with very good reason! Serenely nestled in a leafy Ripponlea side street, only 15 minutes away from the city centre of Melbourne, Quat Quatta was built to originally serve as a family home in 1889. It is easily among the most elegant venues for wedding not just in Melbourne but the whole of Victoria. Boasting fine examples of a exceptional period design features and complemented by luxurious finishing touches and lofty sky high ceilings it really has the wow factor for guests. Today, Quat Quatta is considered as a significant piece of the already rich history of Melbourne. It has also been classified by the National Trust of Australia itself and is among the most well known wedding venues in Melbourne. The nearby Rippon Lea Estate is also a popular wedding venue managed by the National Trust. 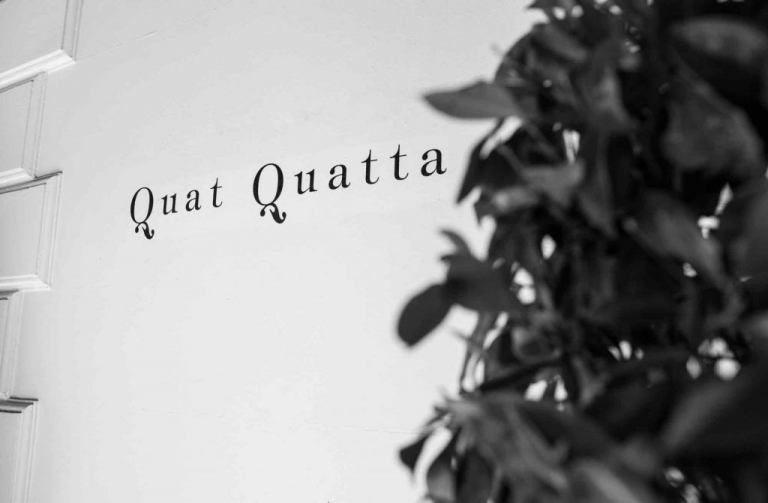 The moment you step through the door of Quat Quatta, it will feel like taking a journey back in time, thanks to the Victorian architecture’s indubitable stateliness combined with the crisp and clean style of modern Australia. What Awaits You Within the Walls of Quat Quatta? The Victorian mansion boasts a large and classic staircase, huge dining room, parquet dance floor and powder rooms for a bridal party to relax in. Couples will love the dedicated suites which feature paintings, embellished mirrors and chandeliers which all feature meticulous intricate details. On the other hand, the dining room is white, spacious and clean. This serves as a great spot for anywhere between 60 and 150 wedding guests to indulge in a chic sit-down dinner. If you have planned a cocktail reception, about 300 guests can be comfortably accommodated. Crisp and white tablecloths with the silver candelabras and cutlery offering a classic and timeless feel to the style of the wedding. Quat Quatta’s catering is also showered with stellar reviews. They specialize in Modern Australian, Kosher, European and cocktail cuisine. The staff is also flexible so you can be sure that all your favorite and preferred dishes will be served during your reception. I’m happy to vouch that they serve reliably great food! The garden at the back of the mansion and the terrace with its paved courtyard is also available for outdoor sunny wedding ceremonies. The lofty green hedges with their manicured arches are a good backdrop for your bridal party and family photos. The garden area is also fabulous for easy wedding photos with wedding photographers loving the ease and proximity to the reception, meaning that even if there isn’t a great amount of time available for wedding photography a large selection of photos can be taken with several different looks and backdrops within a few metres of each other. The front garden is good for family photos too, with the ivy covered wall being an excellent backdrop to frame the photos. The front verandah is suited to couple photos and set ups with the bridal party. Once guests have been ushered inside the venue, there is usually time to make use of the rear courtyard with the bride and groom. The high green hedges and backlit arches can make quite strikingly beautiful wedding portraits. This location also works well at night with the strings of bare light bulbs twinkling in the background of the photos. Perfect! A great money-saving tip if you plan to host a wedding at Quat Quatta is to inquire about their daytime weddings, as the prices are often substantially cheaper than hosting an evening event. Sure, you usually need to vacate the venue by 4pm but your day will probably start earlier with a mid morning ceremony so you’ll be ready for a rest by 4pm anyway! The party can always continue on elsewhere!